A Fiduciary Manager typically looks after all or most of a scheme’s assets, acting as a single point of contact and accountability for Trustees. Why appoint a Fiduciary Manager? Too often, pension trustees wear “two hats”. They act as both non-executive and executive directors. They oversee strategy and make implementation decisions. This makes it harder to evaluate decisions after the fact. If the outcome of a decision is poor, was the strategy wrong? Or was it the implementation? Or both? These are tough questions for one group of decision-makers wearing two hats to ask themselves. Use of an investment consultant who isn’t accountable for outcomes (in law or in practice) can further muddy the governance waters. 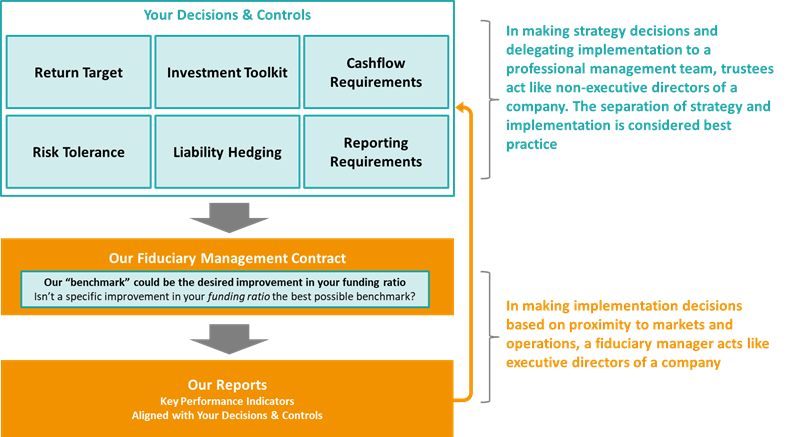 How does Fiduciary Management work? Trustees continue to make the most important strategy decisions. These decisions form the basis of the scheme’s strategy, but they also define a Fiduciary Manager’s mandate, including contractual terms and key performance indicators (KPIs). Some trustees worry that appointment of a Fiduciary Manager cedes too much control. By making the important strategy decisions, hard-coding KPIs in the fiduciary’s contract and monitoring progress, the trustees would remain very much in control. We’d argue delegation of investment decisions to a Fiduciary Manager enables trustees to spend more time on the issues for which they are best placed e.g. long-term objectives, sponsor covenant, member communications, etc. Cardano is a purpose-built, privately owned Fiduciary Manager. This is what we do. We are not an employee benefits consulting firm evolving into an investment manager. Nor are we a global investment manager offering lots of different products to clients with different needs. Fiduciary Management was the right answer for us. It means the trustees can focus on the most important issues while delegating implementation to Cardano. Cardano can get more done quickly. They can be more nimble as markets change and use a broader range of assets and strategies. We’ve worked with big firms and small firms. Cardano is well sized: small enough to care personally about every client; big enough to marshal the resource to do their job very well.